There's one thing in life you love above all others. One thing so sweet, it's enough to brighten even the gloomiest days. And we're not talking about your fave dessert, chocolate covered strawberries (though they are a close second)! Your baby is the sweetest treat of all, and they deserve to look it for their first costume occasion. While you could go the scary route this Halloween—vampire baby, ghost baby, skeleton baby—or perform the classic lil' pumpkin routine, we are refreshed and glad to see you exploring a less conventional take on your tot's first dress-up outfit! 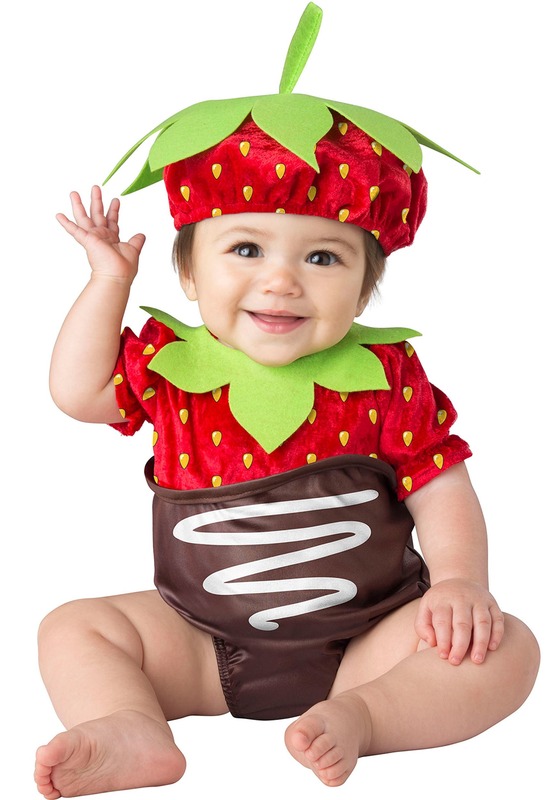 Made to look just like a delectable chocolate covered strawberry, this clever costume is cute enough to gobble up the moment you set eyes on it. Take your baby to Sunday brunch, a birthday, or a costume party in this look, because "sweet' is always on everyone's menu (and everyone loves the person that brings dessert)! Berries and dark chocolate are a healthy combo, so feel free to indulge in your cutie all you like! Just like your favorite dessert, it's almost impossible to get too much, and they're never bitter or underwhelming. Aw. Crafted to make your babe look just like a chocolate dipped strawberry, this jumpsuit has a red short-sleeved top and brown bottom, with a sweet white chocolate "drizzle" effect on the belly. The green collar looks like the top of a strawberry, and the detail is echoed again on the soft cap, complete with stem! "Sweet" doesn't even begin to describe this darling look! Your little one will always be a special treat to see at the end of the day. Why not make a party of it? Ask other parents to meet in the park with their little ones dressed up in their favorite sweets. No one will be able to resist a blanket full of cupcakes, lollipops, and of course, your little berry!